Treating bacterial infections. It may also be used to prevent or slow anthrax after exposure. 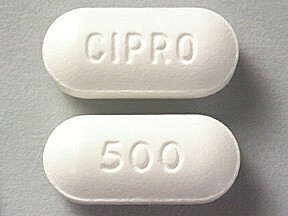 Cipro is a fluoroquinolone antibiotic used to kill sensitive bacteria. It works by stopping the production of essential proteins needed by the bacteria to survive. Use Cipro as directed by your doctor. Check the label on the medicine for exact dosing instructions. • Take Cipro by mouth with or without food. The preferred dosing time is 2 hours after a meal. • Take Cipro with a full glass of water (8 oz/240 mL). Drink several extra glasses of water a day, unless otherwise directed by your doctor. • If you also take any products containing magnesium, aluminum, calcium, iron, or zinc (eg, vitamins/minerals, antacids, quinapril); didanosine; sucralfate; or bismuth subsalicylate, do not take them within 6 hours before or 2 hours after taking Cipro . Check with your doctor if you have questions. • If you also take sevelamer, do not take it within 4 hours before or after taking Cipro . Check with your doctor if you have questions. • Cipro works best if it is taken at the same time each day. • To clear up your infection completely, take Cipro for the full course of treatment. Keep taking it even if you feel better in a few days. • Avoid taking Cipro with milk or milk products (such as yogurt or calcium-enriched juice) by themselves. However, taking Cipro as part of a full meal that contains milk or milk products is permitted. • Do not miss any doses. If you miss a dose of Cipro , take it as soon as possible. If it is almost time for your next dose, skip the missed dose and go back to your regular dosing schedule. Do not take 2 doses at once. Ask your health care provider any questions you may have about how to use Cipro . • Cipro may cause drowsiness, dizziness, blurred vision, or lightheadedness. These effects may be worse if you take it with alcohol or certain medicines. Use Cipro with caution. Do not drive or perform other possibly unsafe tasks until you know how you react to it. • Be sure to use Cipro for the full course of treatment. If you do not, the medicine may not clear up your infection completely. The bacteria could also become less sensitive to this or other medicines. This could make the infection harder to treat in the future. • Long-term or repeated use of Cipro may cause a second infection. Tell your doctor if signs of a second infection occur. Your medicine may need to be changed to treat this. • Cipro only works against bacteria; it does not treat viral infections (eg, the common cold). • Avoid large amounts of food or drink that have caffeine (eg, coffee, tea, cocoa, cola, chocolate). • Rest and avoid exercise until further instruction from your doctor if you experience pain or swelling of a tendon. • Diabetes patients - Cipro may affect your blood sugar. Check blood sugar levels closely. Ask your doctor before you change the dose of your diabetes medicine. • Cipro may cause you to become sunburned more easily. Avoid the sun, sunlamps, or tanning booths until you know how you react to Cipro . Use a sunscreen or wear protective clothing if you must be outside for more than a short time. • Use this medicine with caution in the ELDERLY; they may be more sensitive to its effects (eg, tendon problems), especially if they take corticosteroids (eg, prednisone). They may also be more sensitive to other effects (eg, irregular heartbeat). • Caution is advised when using Cipro in CHILDREN; they may be more sensitive to its effects, especially joint and tendon problems. • PREGNANCY and BREAST-FEEDING: If you become pregnant, contact your doctor. You will need to discuss the benefits and risks of using Cipro while you are pregnant. Cipro is found in breast milk. Do not breast-feed while taking Cipro. • Anxiety; diarrhea; dizziness; headache; loss of appetite; nausea; nightmares; restlessness; stomach upset; vision changes; vomiting. • Severe allergic reactions (rash; hives; itching; difficulty breathing; tightness in the chest; swelling of the mouth, face, lips, or tongue); agitation; bizarre behavior; bloody stools; chest pain; convulsions; dark urine (or unusual change in amount of urine); depression; dizziness; easy bruising or bleeding; fever, chills, or unusual cough; hallucinations; increased pressure within the head; inflammation, pain, or rupture of a tendon; irregular heartbeat; joint pain or swelling; loss of appetite; loss of consciousness; mental changes; muscle pain; nervousness; oral thrush; pain; pale stools; persistent sore throat; red, swollen, blistered, or peeling skin; seizures; severe or continuing diarrhea; sleeplessness; stomach cramps/pain; suicidal thoughts; sun sensitivity (sunburn easily); tingling or weakness of arms and legs; tremors; unusual fatigue; vaginal yeast infection; yellowing of the skin or eyes. Store Cipro at room temperature, between 59 and 86 degrees F (15 and 30 degrees C), in a tightly closed container. Store away from heat, moisture, and light. Do not store in the bathroom. Keep Cipro out of the reach of children and away from pets.